What is the purpose of the party? ​What is the Oak Grove Foundation? 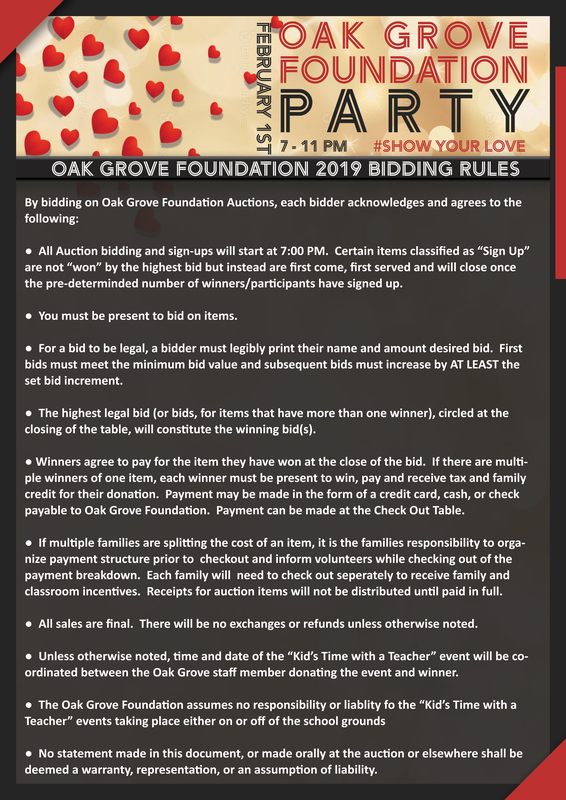 The Foundation is a non-profit 501(c)(3) organization formed by parents and teachers that supports the quality of education at Oak Grove Elementary School through investments in personnel, technology, teachers, and materials, funded entirely through your donations! Click HERE to learn more! The party will be held at Briarcliff Woods Beach Club on Friday, February 1, 2019 from 7-11 pm. All are welcome! This party will feature delicious food from Kitchen Six, a wine and beer bar, an incredible auction, and a DJ. Come out and say hi to other OGE parents, teachers and staff! It’s a great chance to meet new friends and say hi to old ones! Is there a ticket price? All are welcome to attend the party! There is no charge for admission. However, we encourage you to come ready to bid on Time with a Teacher experiences, STEM board wish list items, a wine wall, and other amazing auction items! What can I buy at the auction? Our auction features unique and exciting items. For example, our Time with a Teacher section allows parents the opportunity to win fun experiences with OGE teachers and staff. Want your child to become principal for the day? Gym teacher? Does your kiddo want to watch movies and eat pizza with their favorite teacher? NOW is your chance! We also will have a section of the auction which features a piece of art representing each class grade. This year’s theme is animals. These works of art were completed by the class with the help of our fabulous art teacher, Beth Deery. You won’t want to miss them! What is the STEM Board? The STEM BOARD wish list gives parents the opportunity to buy items off of our STEM coordinator’s wish list. These items will be organized by category and range in price from $30 - $750. They consist of physical items (think iPads) to experiential items (think frog dissections). What are the auction rules? Click HERE to view the auction rules. What are the parameters for auction donations for businesses and families? Click HERE to view the business partner donation parameters. For more information, to make suggestions, donate to the auction, or if you would like to help with the party, please click HERE to email Tracie Maloney. Please email admin@oakgrovefoundation.org with any questions. ​Thank you for your generous donations!